If you’re thinking about buying a piece of workout equipment to begin your strength and muscle-building training, you really should think about starting with dumbbells. And you should start not with just regular ones but with adjustable barbells instead. 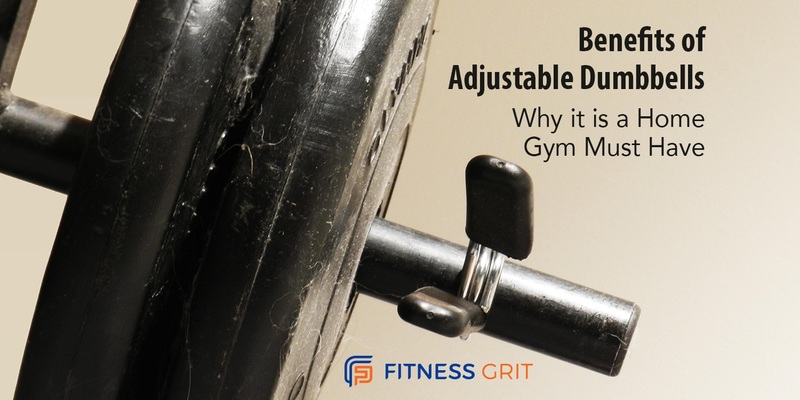 The benefits of adjustable dumbbells can outweigh what you get from barbells and regular dumbbells. Lots of people can find themselves going through some discomfort when they’re using barbells that’s because the design of the barbell forces the hands to stay in place. But many of these people find that these same exercises aren’t as painful when they’re using dumbbells instead. This is quite evident for bench presses, standing presses, and rows. When you do dumbbell press on a flat bench, you’ll find that you have more natural movement. So that makes the workout a lot better for your shoulders and elbows. So don’t force through the pain when you’re using a barbell. Use dumbbells instead. It’s much more convenient when you have a home gym than when you’re a gym member. You don’t need to travel and you can work out any time you want. In the long run, you also save money. But barbells aren’t really all that practical for home use especially when you live in an apartment. A heavy barbell can at the very least annoy your down floor neighbor. The worst case scenario has the barbell going through the floor and hurting people. Dumbbells don’t present those problems. And you won’t have any space problems either. That’s especially true when you get adjustable dumbbells. You effectively have a single bar where you put on plates of varying weights. To add to the adjustable dumbbell benefits, they’re easier for you to set the weights and it can be more affordable than having an entire set of regular dumbbells. With traditional dumbbells, you need lots of space to store all those dumbbells. When you use barbells, sometimes you inadvertently compensate by using your dominant hand to carry the weight. Often your one side is stronger than the other, and this strength imbalance can lead to lots of problem. With dumbbells, you can make sure that both arms are carrying equal weight. Instead of doing barbell curls, do dumbbell curls instead. You can even use the dumbbells to focus on your weak side. You can work your weak side more so that you can balance out. Then with the dumbbells you can maintain that balance. With the barbells, you may revert back to using your dominant arm more. Haven’t you noticed that if you can do 8 bench press reps with a 200-pound barbell, when you switch to dumbbells you can only press a combined weight of 160 pounds for the same number of reps? That’s because dumbbells are more free form and less stable, so you use more muscles to support the weight. So dumbbells are more challenging, and therefore more effective. Sometimes using a barbell can be a lot riskier than with dumbbells. When you’reworking out alone, a barbell can be dangerous when you don’t have a spotter. But you don’t need to worry when you’re using dumbbells instead. When you’re doing reverse lunges with a barbell, you can get injured when you lose your balance. That’s why it’s crucial that you use a power rack when you use barbells. That adds to the cost. But with dumbbells, you can just toss them when you lose your balance. How do adjustable dumbbells work? That depends on the type you get. One version requires you to add and remove plates to get the weight you want. Another lets you just slide a knob and the right plates stay on the dumbbell automatically. Either way, the benefits of adjustable dumbbells means you train more effectively, more safely, and with less money and space requirements.